Town of New Hartford, New York - PICKLEBALL at Sherrillbrook Town Park! PICKLEBALL at Sherrillbrook Town Park! What is pickleball? 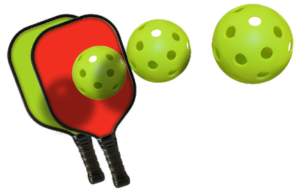 It’s a game that combines the skills of tennis, badminton, and ping pong. It’s played on a small court with a net, paddle and whiffleball. It’s easy to learn and has become one of the fastest growing recreational sports in the country! New courts are in the works! Six new courts at the Sherrillbrook Park are being built! Paving is done and the fencing is done. Permanent nets/posts and court lines will done done as the weather allows. Painting of the courts needs to be done in warm weather, so be patient. Anyone interested in playing when the courts are finished, contact Wendy at karwen@roadrunner.com. You can be added to a pickleball email list to keep you informed of pickleball news. Organized play info, including times and days, will be sent via email. Upcoming beginner lessons will be determined at a later date. The courts are free and may be used from dawn to dusk.